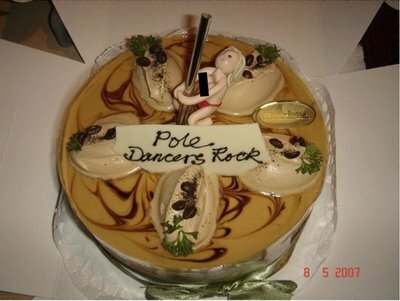 I'm trying so hard to dissect that pole dancing cake - marble cheesecake with a silly-putty pole dancer on a wind-chime tube, surrounded by piles of hummus topped with coffee beans and parsley? Well, I would love to have been in THAT pitch meeting. The funny thing is, I've actually met a woman who named her child something like Shante' and when I saw her write it down I thought she was trying to write an accent over the e but she said no that she'd just written an apostrophe at the end of his name on the birth certificate and that she thought it was cool. I can't help it, I have to ask .... is that a SPERM whale? OM goodness.....so darn funny I can't take it!!! Laughing so hard at your commentaries ...my sides are killing me!!! I cannot believe they honestly MAKE these cakes! Thank you for the crying laugh. I read these when procrastinating because then I'm inspired. My first thought was also about whether the 'audience' surrounding the pole dancer was a group of hummus lady-parts with staring eyes. 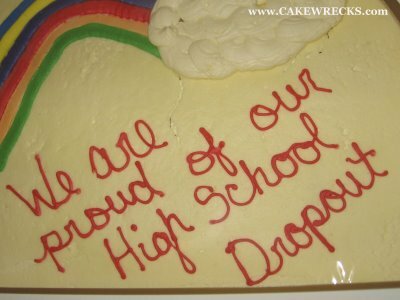 Also, let's never use the phrase "Herpes Cake" again. Ever. I must illustrate this in comic form!